means home, habitat or environment. "-logy" means what is believed to be true about science. But, something is wrong with this picture! 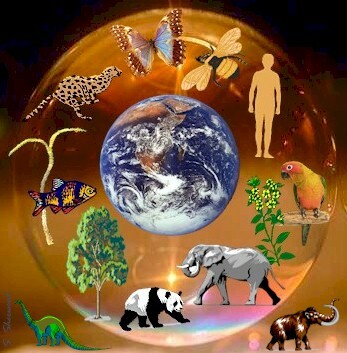 Humans are not separate from all other living organisms and the environment. We do not live in a bubble that keeps us apart from the rest of life on our planet. Humans are very much a part of the interactions that take place in the web of life. In fact, we have a very profound effect on species and the global environment, so we need to include ourselves (the human species) as we study about the environment of the world we live in. "Ecology is the scientific discipline that is concerned with the relationships between organisms and their past, present, and future environments. These relationships include physiological responses of individuals, structure and dynamics of populations, interactions among species, organization of biological communities, and processing of energy and matter in ecosystems." "A mind stretched by a new idea can never go back to its original dimension." 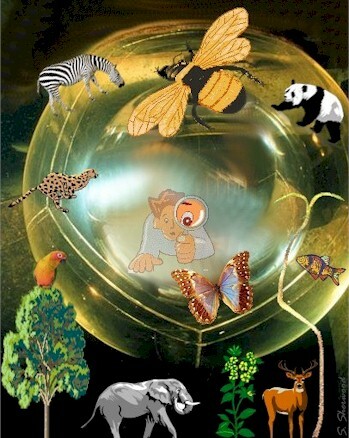 to help you learn about ecology and scientific investigation. Learn more about ecology and how you can become an ecologist. Links to an ecology project and ecology club ideas. What do ecologists do? Click on individual names to learn more about each scientist's career. Clicking "next" at the bottom of the page brings up the next group of scientists. Science is described as: "knowledge or a system of knowledge"
Science is an ongoing process of a systematized, orderly accumulation of data and understanding, based upon scientific observation, experiment and testing. Much science is based on theories, or scientifically acceptable explanations of things. hypothesis A possible explanation based upon what we know. theory Unproven, but scientific analysis indicates it is most likely true. within the range of our knowledge and capability. Within the range of our knowledge and capability...We know much more today about such things as planets, living organisms, medicine, and Earth's interior than our ancestors did in the past. They based their knowledge on what was previously thought to be true and their own observations and experimentation. Others came along with more "ifs," "ands," and "buts," and applied further scientific observation, experimentation and testing, along with more technology (new inventions such as space telescopes and computers), and modified and expanded our base of scientific knowledge. Today's scientists, like previous scientists, also utilize past knowledge and apply their own theories and current scientific methods available to them to come up with explanations, and hopefully facts which can be proven in all cases (well, in all cases that we know of up to this time). What we accept as fact today may very well change in the future; probably will change in the future (that's our theory). Scientific knowledge is ever-changing as we continue to develop greater technology to help us analyze information. Science is not based upon the studies of one individual, but upon the scientific studies of all those in pursuit of knowledge, both past and present. Sharing in our scientific research and information regarding issues relating to the health of the environment, Earth and living organisms is a major advancement in our progress toward sustainability. Right now scientists around the world are working feverishly to try and understand the workings of the Earth system, global climate, global warming and cooling, the hydrological (water) cycle, the carbon cycle, and the effects human activities are having on natural processes. Take a look at what's going on in international research on our Global Change page - it's phenomenal! And the scientific community is going to need the youth of today to be educationally prepared to continue increasing our understanding and putting more pieces of the puzzle together in our ongoing pursuit of knowledge and search for solutions toward a sustainable world community. geoscience The sciences dealing with the Earth (geology, geography, geophysics, geochemistry). But they don't have to begin with "geo." There is hydrology, soil science, botany, oceanography and many other fields of science that pertain to Earth. geology A science that deals with the history of the Earth and its life; especially as recorded in rocks. The study of ancient environments and their relationships to ancient plants and animals. We investigate the past to help us learn what worked - and what didn't work. We learn from the history of Earth, from the fossils in rocks, and from our mistakes in the past. This helps us make better decisions now for the future. "Wander back through the ages to an alien planet called Earth. Learn about dinosaurs, bizarre plants, fossils, soils, geography, geology, and more." The American Quaternary Association (AMQUA) is a professional organization of North American scientists devoted to studying all aspects of the Quaternary Period, about the last 2 million years of Earth history. Geologic Time Chart - Take a trip back in time, 4,500 million years ago. Below the color-coded chart is a color graphic of various colored spaces in a straight line representing time periods. Note the small black space - that represents from today all the way back to 11,000 years ago. 11,000 years in that tiny space! Our average lifespan is but a speck in the history of Earth. From 5 million years ago back to 23 million years ago is considered "moderately recent"! Stream Biology and Ecology "No ecosystem can be studied in isolation." Wonderful educational material about the ecology of streams and rivers written by a biologist. We have this link on our WaterWebs page, but we thought it appropriate to list here also since it explains the scientific method of study in their Science link). Scientists tell you about their interesting work in different fields. Careers in health and science are interesting, fun, and rewarding. Links to other resources are provided. Helping transform the nation's college and university campuses into living models of an ecologically sustainable society. Conservation projects, scholarships, internships, and training for a new generation of environmental leaders. Established and supported by the National Wildlife Federation. If you are thinking about majoring in the environmental sciences in your educational endeavors, scroll through this list of course requirements and options to give you an idea of the broad variety of disciplines involved in environmental science. Note: There are many fine institutions offering environmental education and we are not promoting one over another. High school students should start preparing early and investigate all their options. Unity College A small independent college in rural Maine which focuses on education in the fields of environmental science, natural resource management, wilderness-based outdoor recreation leadership, and related fields. Career Resource Center - Start preparing now developing skills and values to work in the environmental fields. Hiking, swimming, map and compass reading, tracking animals, and bird and plant identification are some of the skills you can work on yourself. Links to information and directories related to employment and internships (states, federal, overseas, seasonal/full time, environmental sciences and general). Learning Skills Resources provides links to help you become "more efficient and effective learners." Scroll down the list and you will find some great resources, like help on procrastination! So what are you waiting for? Want to work with conservation professionals and count Orcas from a kayak off Alaska, be part of an archaeological survey team in New Mexico, be a wildlife intern in a national park, build nature trails in the mountains? See what opportunities are available in the environmental and conservation services. Click on the video and listen to what students have to say about spending a month deep inside a national park forest working on projects to help the environment. "First-of-a-kind" research has begun in the Amazon rainforest sponsored by NASA and the Brazilian government. Over 150 scientists and students will participate from various countries in a cooperative effort to study and investigate the region's impact on global change, and develop information for sustainable resource management solutions. Extensive research will be conducted on the water/nutrients/carbon cycle, land-use (such as logging and pastures), and many other projects pertaining to the hydrology, meteorology and ecology of this massive ecosystem. A tower has been constructed for field researchers to climb up into the high canopy of the rainforest. As this research develops, there will be more information available on their site. you learn a kind of standard integrity and honesty. to allow its natural life-giving processes to continue.